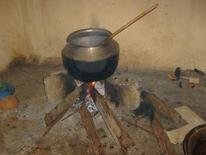 "Oru Panaai" is a well known Tamil expression and means one pot in English. It reminds us of our humble origins and our communal responsibility. Oru Panaai (UK) was established in 2008 as a voluntary humanitarian response to appeals made by heads of rural schools in the Jaffna peninsula of Sri Lanka. They reported to us the poverty and starvation of the poor children who attended their schools. Oru Panaai seeks to alleviate hunger in school children in Jaffna in the first instance. At present we are helping 311 schools to feed 33,000 children. Oru Paanai Trust (Sri Lanka) was established in 2011 enabling Oru Paanai to provide an official local charitable base in Sri Lanka. With your help we can spread the work of Oru Panaai to cover more schools in Jaffna peninsula and beyond. Dr Dan Muthuveloe, Dr. K. Nandhabalan, Dr. Lawrence Ratnam, Dr. N Rajakumar and Dr. Leela Muthuveloe. Email: secretary@orupaanai.org.uk or please use the form on the Contact us page.